Vote for your favorite Dance Transformation! In each Chapter of the game, Shantae will defeat a boss and gain a Dance Transformation. When she dances, she can change into a new creature form with new abilities! 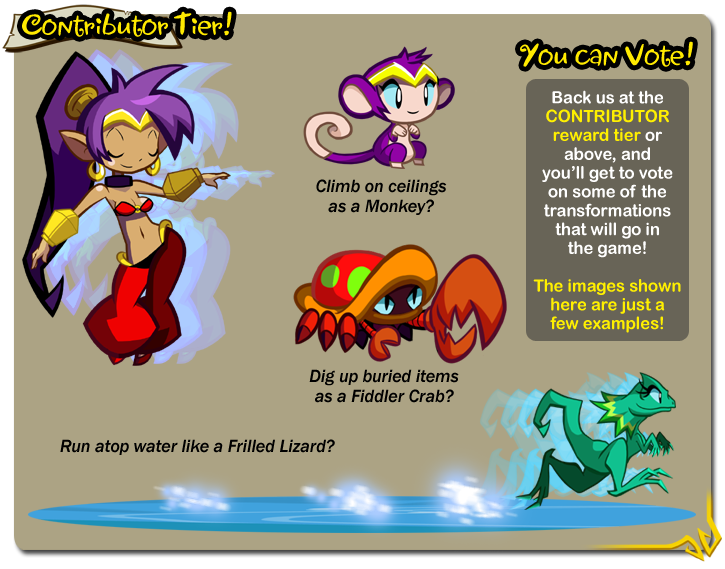 Past games have seen Shantae changing into a wall-climbing Monkey, a boulder bashing Elephant, a web-climbing Spider, a deep-diving Mermaid, and even a Tinkerbat or Harpy. We have a few transformations planned that are vital to Shantae’s mobility. But the others will be decided by YOU, the VOTERS! If you’ve pledged at the Contributor Reward Tier (and above), you’ll be voting for your favorites, and the winners will be put into the game. The number of total transformations is not set at this time, since our number of Chapters isn’t locked down yet (the more Chapter-based Stretch Goals we meet, the more transformations there will be). The new Custom Dance design allows us to be more flexible with the number of dances and transformations than before, so a “minor transformation” could simply be used to rocket into the sky, torch a thorn patch, or emit a screeching sound. Not all transformations need to have full mobility either (like say, a Tree-like Dryad that drops life-restoring fruit). We have tons of ideas and we bet you do too! Let’s earn that CONTRIBUTOR CREDIT and make this game burst with fresh ideas! Voting will occur during the game’s development, but ANYONE can throw ideas at us on the “Comments” message board. StoneMonkWisdom, Guilherme Reis Bonfim, and 8 more people like this update. Since the mermaid's been revealed is there a reason to run on top of water? I don't like that spider creature, I think the same spider form from the orignal GBC would have been way better. That spider is pretty amazing! But I really love the Monkey, Harpy and Lizard as well! The Frilled Lizard is a must. What about a dragon Shantae? Lamia Shantae? Greatly increased physical strength allowing her to pick-up and throw boulders? @Cory Don't worry, the spider is planned into the game. Fans have to worry about The last three power ups listed. The spider one seems to call to me. I want spider in the game. http://i.imgur.com/OnAGPSK.png I heard you guys were up for suggestions, so I drew one of my favorite animals as a transformation: A wild boar! 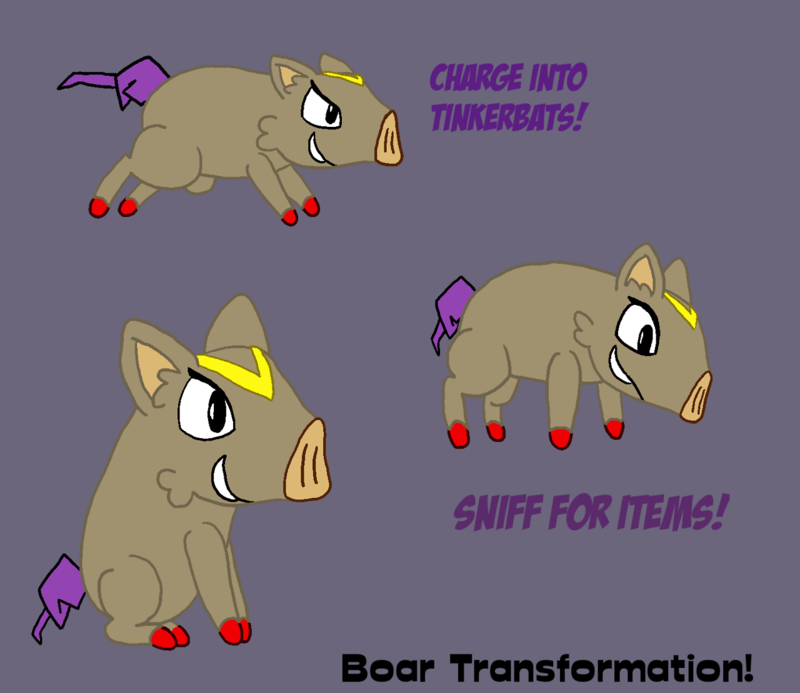 It can sniff out hidden gems or hearts in the ground like a pig sniffs for truffles, and it could get a charge attack to bash weak enemies (and possibly rocks, if needed to advance the story)! How about a dance that can slow down time for a bit (more of utility rather than transformation)? Guys, we're not even voting on which transformations will be in the game. Every guy who says "bring back the Harpy" or "why is the Monkey even up for debate" is just burying the new ideas for transformation that people are coming up with here, like the Ghost, Armadillo, Kangaroo, Werewolf or Salamander forms. Voting will come later in production. I'd like a harpy, please. They are my favorite monster girls. Gunmouth, haha, I'm digging that idea of "Ghost Shantae," particularly the "Possessing enemies" aspect. She should be able to turn into a golem like the ones she destroyed in Shantae: Risky's Revenge. Where do I go to vote on transformations? Do I put my input right here? If so I have to say that a dragon transformation is an amazing idea. My personal choice would be that she can transform into a wolf or similar predator. Matthew: I disagree with you on the monkey. The monkey's agility and jumping ability made her very useful in even non-climbing parts. But I do agree on the elephant. Elephant could've been more useful. 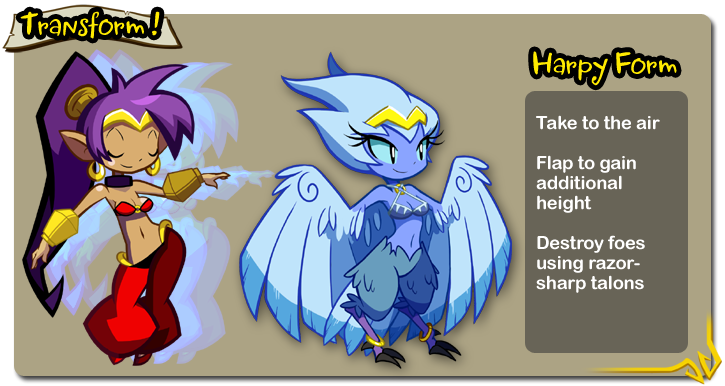 Anyway, I love the harpy design! I wish I had the money to enter the contributor status so I could vote. Oh well, I can still offer suggestions! How about a dragon Shantae? She could fly and breathe fire, or fly and have a poisonous dragon bite that damages enemies for a few seconds after being hit... A bat form could fly, climb, and fit into small areas. How about some kind of cat? Maybe a large cat like a lion or tiger that has good agility, powerful short-range attacks, and a roar that paralyzes enemies for a second. A dinosaur would be cool as well, like a raptor of some sort. Fast and powerful! Or how about a T-Rex or pachysaur that can bash enemies with their heads? I'm biased and I want to see a mermaid Shantae again. Maybe a sea-dragon type mermaid that can swim in water and slither on land, and has a few cool attacks. While I'm at it, I'll suggest other underwater transformations. A sea turtle, good defense. A dolphin with echolocation so you can find hidden treasures and passages in the dark. An eel that has an electric attack. A couple doodles for a "Ghost Shantae" transformation. *The idea would be she can fly anywhere, and pass through solid objects, BUT she cannot physically interact with other objects. *She CAN, however, take control of another baddie, and use them to switch levers or attack other enemies. *Flight speed is not very fast, and this form drains magic FAST. When the magic is out, you return back to where you first transformed into a ghost. This allows for interesting puzzle elements. More ideas on this later. That harpy form *must* be included... please? I read the comments after I posted my one and was quite surprised to see a handful of others suggested a Centaur Form for Shantae as well. -Ice breath that freezes enemies. -Can roll into a large snowball while going down slanted floors. -Forming icicles that can be fired as projectiles. -Shantae gains knight armour and a sword she can use to cut enemies and maybe ropes and grass as well. -Can detach head and throw or bowl it at enemies to attack them. Detached head can also be used to access unreachable areas and items. -Enhanced defense, resulting in taking less damage. -If Shantae's head is attacked while it's detached, she'll take more damage. Maybe Shantae could have a Centaur Form in which she's able to move faster, jump higher and fire [aimable] arrows with a bow. 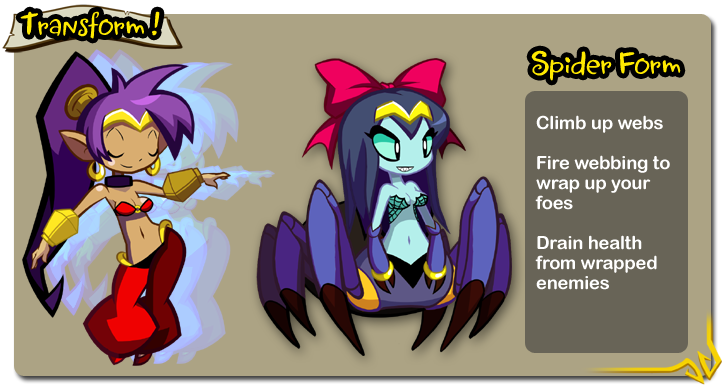 Nobody wants a catgirl Shantae with cheetah speed powers That spider Shantae is just amazingly cute. The one transformation that Shantae is missing is some half snake hybrid. Whether it's a naga or a lamia doesn't matter to me. Just make one of them a transformation. And I really like that spider. As much as I love Shantae's transformations, they seemed a little context-heavy in Risky's Revenge. "Oh look a boulder, better use the Elephant. *crushes boulder* ... Well alright Elephant time is over." It seemed as though there were designated "sections" for each transformation, which in my opinion, shouldn't be the case. Throughout the entirety of the game, each transformation should feel as though it's still useful, instead of in specific areas like I explained. Same thing with the monkey, there were spots you couldn't reach, so you used the monkey. But as soon as you reached it, there was no longer a reason for you to stay as a monkey. Each transformation milestone shouldn't only feel like you're passing a gate blocking your forward progress, but become something you *want* to use for other reasons as well (instead of just *needing* to). Adding more functionality to each transformation will help, and I notice that that has become a focus. Instead of just traversing terrain, there are other uses. As new enemy types are introduced, the player should have attacking *options*. This thought process is amazing. It gives freedom to the player in an otherwise linear-feeling adventure. I think Shantae should transform into a naga. Her abilities should include poisoning foes with her venom, hypnotizing enemies to become confused and fight other enemies, and maybe be able to sneak passed certain situations. For what I see, I like the harpy best. Although it would be cool to transform into something like smoke. I really like the spider one. Idea: Shantae should transform into one of Sky's warbirds, and we'd have more interaction with Sky and especially kooky dialogue with her birds and Wrench. That opens the door for flying into small spaces, mini-game concepts, a diagonal dive-bomb attack, and maybe even a neat story scenario where Shantae and all the warbirds deal the final blow to the Chapter's boss. Lamia master race reporting in. I would probably nerd all over the floor if I saw our favorite heroine transform into a lamia. Wow, so many great ideas here! I have to chip in my support for a Naga Dance and a Warp Squid Dance, just because those creatures have such a presence in the game world and Shantae could be way cuter than any one we've ever seen. Personally I would love some form of Lamia/Naga transformation. That would be pretty cool. I say revamp mermaid Shantae but make her less scaly green and little more mermaid-esque and add some full underwater levels. Turn her hair whip into a tail whip or make her into an undine and allow her to use water and ice powers on land or in the water. Also there could be a lunar Shantae. She could like find a magic moon stone that gives her moon like powers which allows her to put minor enemies to sleep, temporarily stop time and make barriers out out of moon light. Lunar Shantae could look like Dancer Shantae's but white with silver accents with veils hanging from the arms. @Vince Vazquez the fire spirit would be Ifreet, djinns are wind spirits. That Fiddler Crab! *____* I'm in love, that is the cutest Shantae I've ever seen! or a Lamia that can poison targets and possibly bounce on the tail to get a bit higher. Do the chickens have large talons? I don't understand a word you just said. Sorry but the post made me think of that scene. Well, I can't vote in the Contributor tier unless I miraculously come into some money soon :( But I do have some ideas for cool transformations. Thanks for letting us vent said ideas in the comments, Wayforward! Ghost Shantae: Hovers around at slower-than-run speed, and enemies & attacks pass harmlessly through you. On the flipside, you have no attacks. Instead, your reduced fall speed lets you land on otherwise-impossible platforms and gain access to new paths. While you can also pass harmlessly through certain gates (like bars/barred doors and vents. You are also at the whim of any fan-type devices, that just blow you around in this gaseous form. Medusa Shantae: Not really 100% accurate to the myth, but this form would allow Shantae to turn to stone. Like Tanooki Mario, sort of. So in addition to being momentarily invulnerable, you could also, say, smash through certain floors by jumping up, turning to stone, and breaking through the material. As for the snake-hair? 2 ideas there: She could whip it around like normal, and it would add a poison damage-over-time effect to enemies, or you could whip certain "hook points" and swing around like in Bionic Commando. - Armadillo Shantae: she's slower than most other transformations, and has little to no jumping, but she can roll into a ball to knock into enemies. The longer she rolls, the more momentum she picks up and therefore the more damage she can deal. - Pomeranian Shantae: attacking is nonexistent, but at the same time, enemies will take care not to attack you. Because who could ever hurt a Pomeranian? - Snake/Naga Shantae: hypnotize enemies to hold them in place, then dash into them with a poison bite. - Mole Shantae: dig into the soft dirt for treasure, secret passages, or more treasure! - Kangaroo Shantae: jump higher, kick harder, or pummel them with your boxing gloves! Kangaroos wear boxing gloves, right? I think I saw that in a documentary. - Bat Shantae: swoop into enemies and bite them for damage and regained health, locate hidden passages with your echo voice, or just fly free. Unfortunately, small bats are neither strong nor durable, so watch out. - Frog Shantae: lookit that tongue. Bet you could do a bunch with that thing, huh? Grapple onto points with it, or eat enemies whole. That kinda stuff. I'd personally love to see a werewolf, myself. A werewolf? Well, yeah, because we don't actually see many lady werewolves, it's usually overly buff blokes. So why not a strong ladywere instead? That could be rather amusing. And if you have a water stage or two, an octopus could be fun! Or if you're feeling really inventive, a lady friend of mine would probably suggest a sea slug.